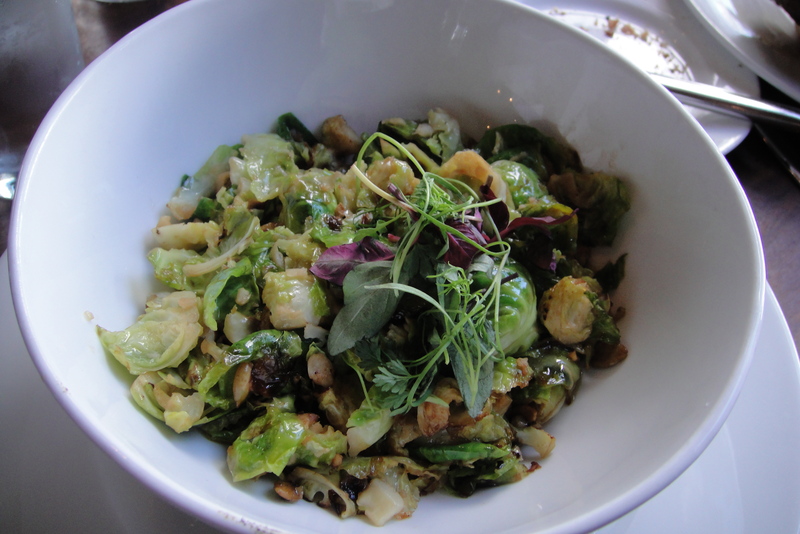 Weekend in Sausalito (Part 2) – Brunch – Cin Cin, Let's Eat! Breakfast is my favorite meal of the day, but on weekends, it’s all about brunch. On Saturday morning, we had planned to take the ferry over to the SF Ferry Building to pig out in the afternoon, so I cooked up a couple simple items for the 8 of us – yes, my baby niece sampled some too! This was something I had on a trip to the Blue Moon Diner in Baltimore. the Captain Crunch french toast was not on the regular menu, but I believe it’s always on the special’s board. (It’s also been featured on a few of the food/travel shows.) Captain Crunch is one of my favorite cereal (that is, when I am feeling junky), and it’s my favorite topping for frozen yogurt. 3 slices of scrumptious french toasts coated with CC dust, topped with berries and whipped cream…I was in love. It’s such a simple dish, and the cereal adds that twist to a classic brunch item. Put the cereal in a gallon-size ziploc bag. Use a rolling pin or a heavy bottom pot (like a dutch oven or a cast iron pan), roll or press or mash until the cereal turns into a cracker meal. It’s perfectly fine to have some bigger pieces. Transfer the cereal into a shallow dish. Combine the cream, milk, eggs, sugar, cinnamon, nutmeg, vanilla together. Whisk until combined. 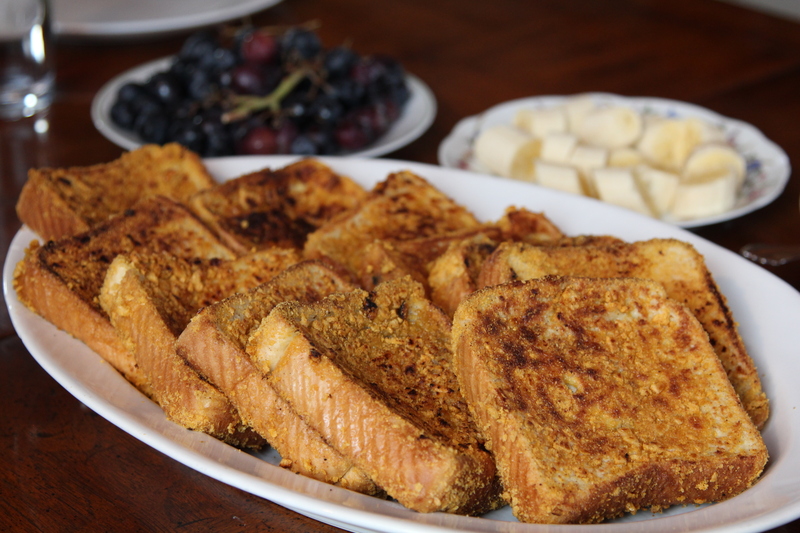 Dip the toasts in the cream/egg mixture, a couple slices at a time, about 10-15 seconds per side, just so that it’s partially soaked through. Let the excess cream mixture drip then dredge with the cereal. Press each side into the cereal. You can soak and dredge as you go, or do them all at once, and let them rest on a baking sheet. Add butter to your griddle or large skillet, over medium heat. a few slices at a time, about 3 minutes on each side. 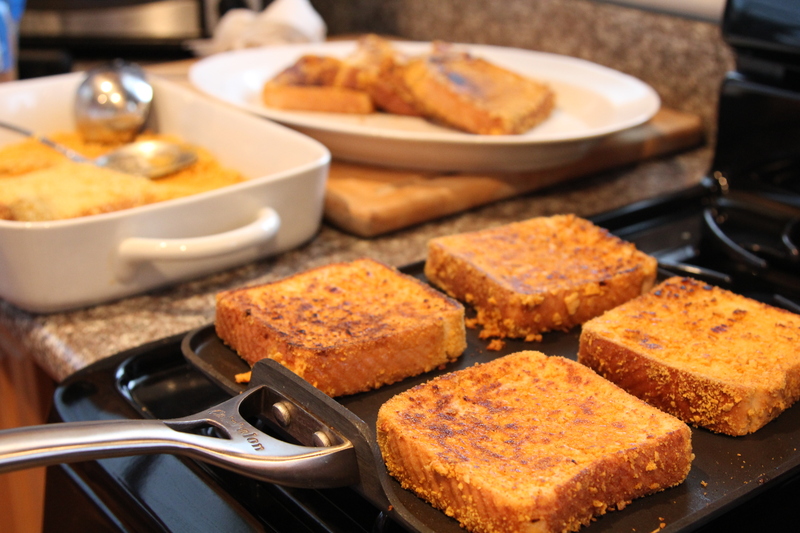 Serve immediately or keep all the french toasts on a baking pan in a warm oven until you’re ready to eat. It’s great with jam, preserves, fresh fruit, or a big heaping pile of whipped cream! Frittatas are so easy to whip up, it’s a great way to clean up your fridge because you can add lots of veggies or ingredients you probably already have on hand, such as shallots, potatoes, broccoli, mushrooms, tomatoes, leeks, spinach, pancetta, ham…do I need to go on? and herbs! It’s a great way to use up those leftover sprigs of parsley, basil, thyme, and rosemary. Usually frittatas have some kind of cheese added to them but I chose to omit cheese because we planned to head over to cowgirl creamery later at the Ferry Building to sample their gazillion cheese offerings. In a large bowl, whisk the eggs with milk, season with salt and pepper. In an cast iron pan or a large oven-safe skillet over medium-high heat, saute the diced bacon. Let the fat render and until the bacon slightly browned. Stir in the garlic, onion, then the asparagus. Bell peppers cook pretty fast so I stirred that in last. Pour in the egg mixture. Stir the vegetables to make sure that they are evenly distributed. Cook for a few minutes until the bottom sets, stir occasionally to let the uncooked egg mixture get to the bottom. Pop the pan or skillet into your oven. Cook for 15 minutes or until golden brown and slightly puffed. 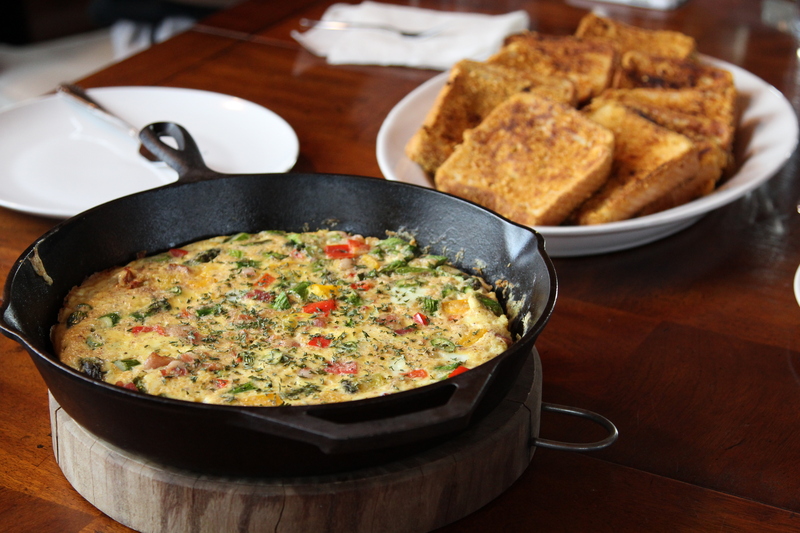 Optional: If you would like to add cheese – Take your frittata out of the oven after it’s slightly golden brown. 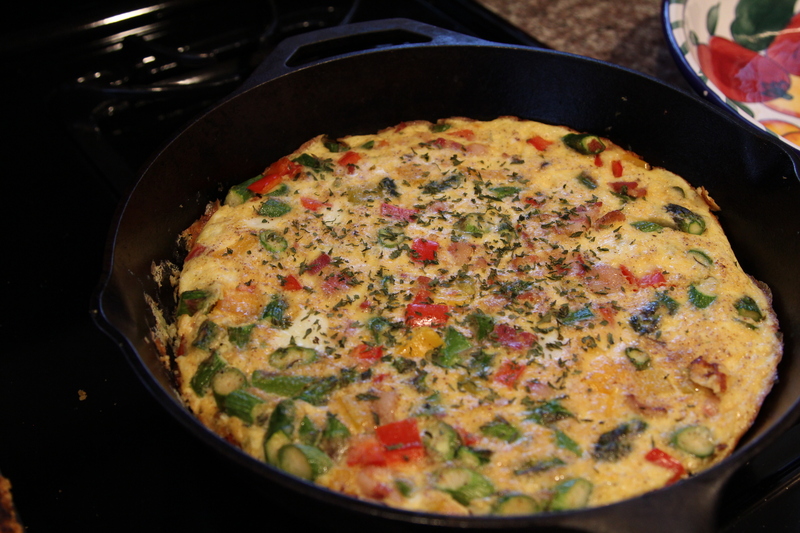 Turn the broiler setting on, sprinkle cheese on top of the frittata, put it back in the oven for 1-2 minutes. Sprinkle with chopped parsley. I also sprinkled with some truffle salt. Slide the finished product onto a big wooden chopping board or serve it in the cast iron pan that it’s cooked in, either way, both beautiful and rustic. It for sure will wow your guests. Located by the marina, it was somewhat difficult to find, as it is in the same huge lot with other industrial looking buildings. But it’s right next to the water so keep heading towards those boats and you’ll find it! 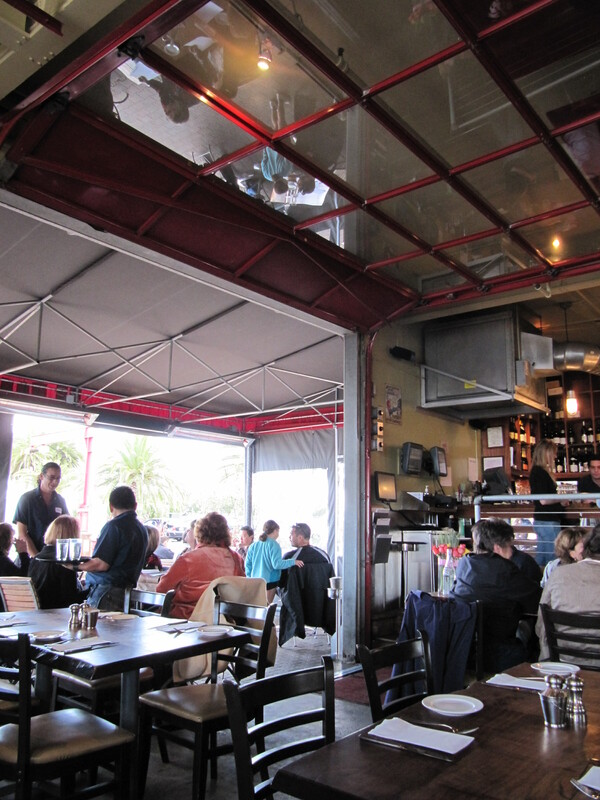 Le Garage is a French bistro that serves 3 meals a day and is the perfect spot to have a relaxing brunch. However, they only take reservations for dinner. We came at 11ish on a Sunday and JUST beat the rush. Le Garage is literally in a garage, slighty hipster-ish but overall, a clean and classic ambiance that gives out a certain warmth. Lucked out again, what was supposed to be a rainy weekend, turned out to be sunny and clear. 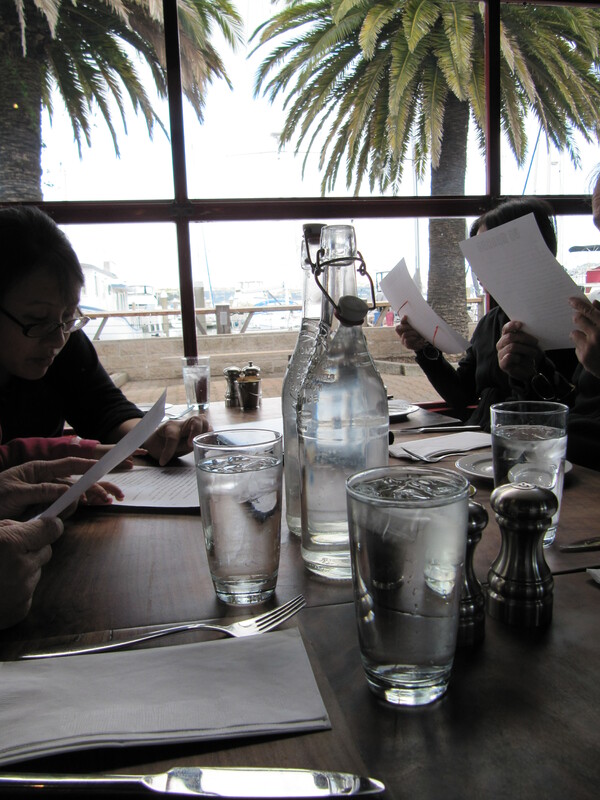 We sat inside by the windows, overlooking the marina. So perfect! 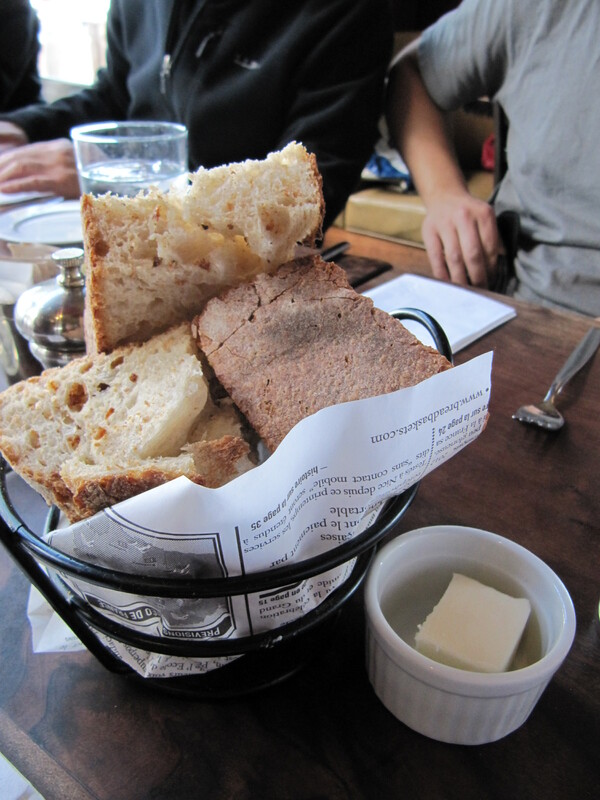 Sourdough bread. great crunch, soft on the inside. These were good and I’m normally not a sourdough fan. 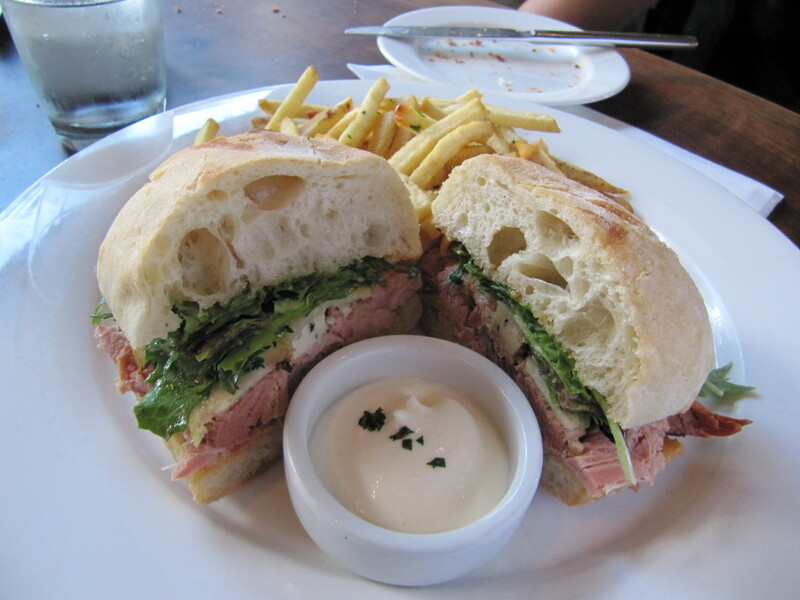 …7 hour house-made ham sandwich with Bleu d’Auvergne, mutsu apple, roasted hazelnut butter and organic baby red mustard, served with fries and aioli… So tender! the sweetness of the apple really made the dish. 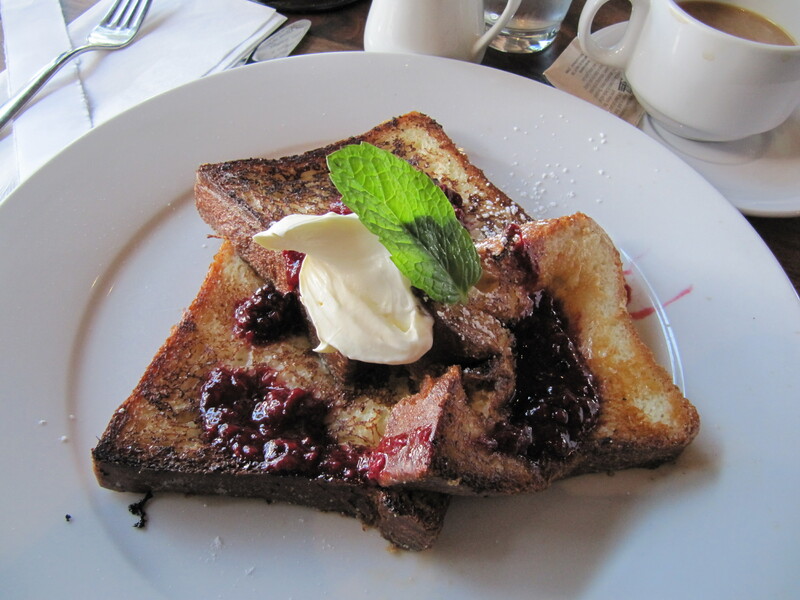 …Pain Perdu – brioche French toast with creme fraiche & a house made fresh berry compote…This is what I ordered and I could’ve ate another plate of the same thing, it was highly addicting. Something about that custard the toasts were dipped in…so rich and satisfying. 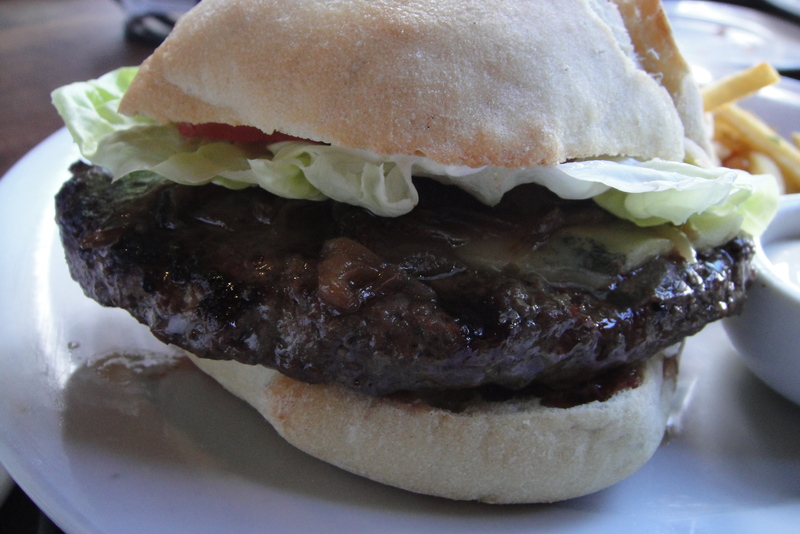 …Masami Kobe beef burger – 1/2 lb of Kobe, Morbier cheese, tomatoes, butter lettuce, grilled red onions & aioli on ciabatta served with a side of fries...I had a bite of this and those grilled red onions really made a great impression. The beef was buttery and very well-cooked. 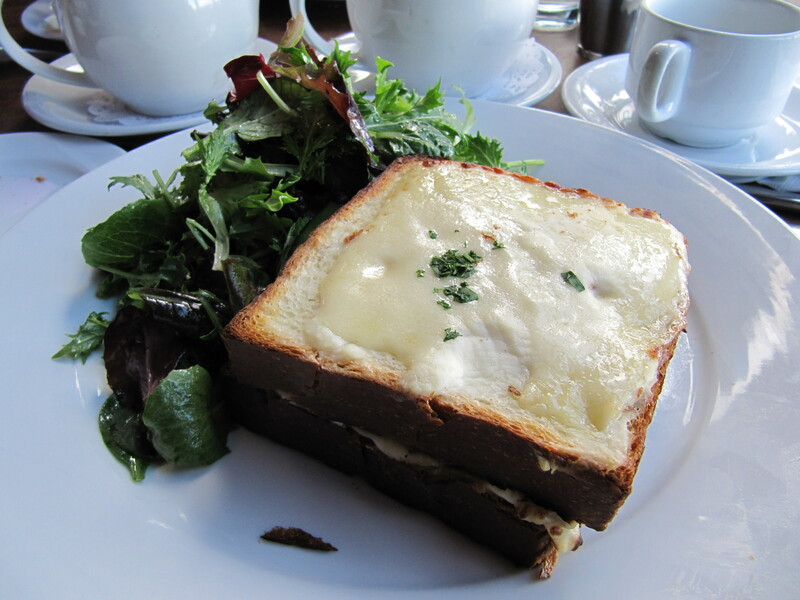 …Croque Monsieur – ham, bechamel and gruyere on brioche with mixed greens …Gruyere cheese’s saltiness paired very nicely with the ham and the creamy bechamel. 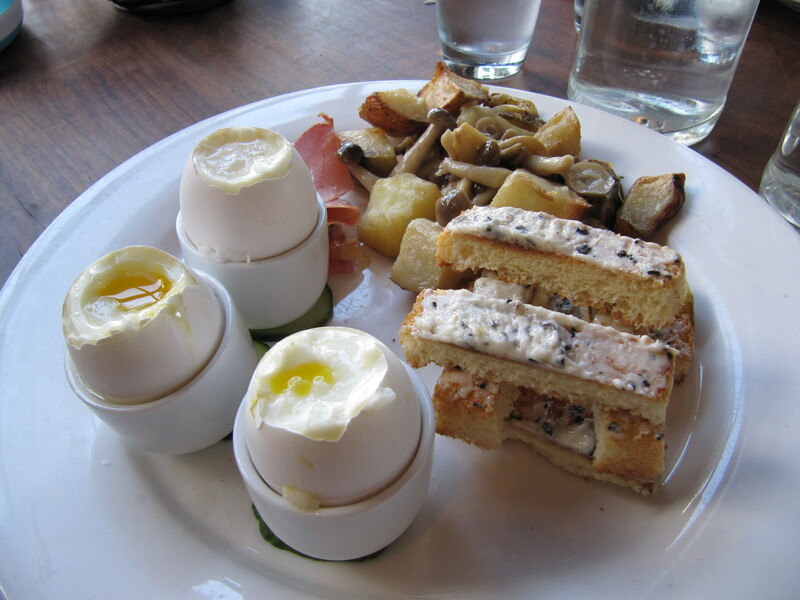 …Oeuf a la coque -2 soft-boiled eggs and black truffle butter mouillettes served with aged Serrano ham, roasted potatoes and beech mushrooms…Black truffle butter…NEED I SAY MORE? And yes, I’m obsessed with soft boiled eggs and love to eat them in the little egg holder, reminds me of my childhood. My bro-in-law ordered this and the extra egg was for moi. Hmmmm, I think I will have a soft boiled egg with toasts smothered with black truffle butter for breakfast tomorrow. (Yes..I splurged and bought some truffle butter at WholeFoods. It’s just too good!) I try to spoil myself and cook a nice breakfast when I have the morning off. Maybe I’ll cut and stack them mouillette style too…nah, I don’t have that much time. Hope you enjoyed looking at all the food pictures. There are two more Sausalito posts coming. We really ate a lot. oh man so hungry reading this in the morning! my yogurt for breakfast is not doing it! Le Garage looks amazing – definitely on my list to try next time. i’m glad you guys ate a lot because that means more pictures for us to see! I was a little disappointed with the ham sandwich. It sounded so exotic, but it ended up being really dry and not too flavorful. The food you made that weekend was definitely much better! Can you taste the vanilla in the cap’n crunch toast? And yes, I always have leftover herbs! Next time will use in a frittata! I just saw a spotlight on Le Garage recently on TV. Now I absolutely have to go! I love soft-boiled eggs, too. What a nice bro-in law you have! Yum to every picture and description.